Some work situations need delicate handling but, as long as you assess the situation, plan what you want to say and are prepared to listen, you can achieve good outcomes from difficult conversations at work. Sooner or later in our working life we all find ourselves facing a conversation at work that has the potential to be difficult. This could be due to heightened emotions, a sensitive topic, the possibility of negative consequences, having to give somebody news they may not want to hear, or even a heady mix of all of these. You may be a project manager who needs to tell key stakeholders about a potential problem on the project; you may be a manager who needs to give some tough feedback or tell someone they are at risk of redundancy, or you may have to tell a client an important delivery is going to be late. 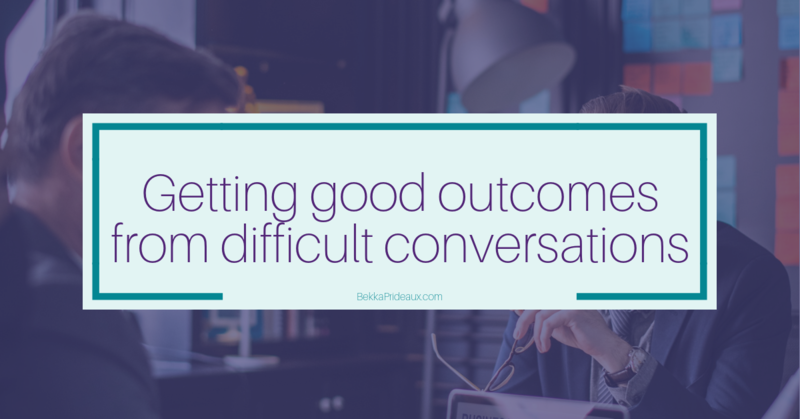 I have worked with many clients over the years to assess what has gone well in these conversations in the past and on how they will approach the difficult conversations they face in the future. This work with clients has highlighted the challenges of these conversations but has illustrated that it is possible to get consistently good results if three broad areas are considered before the conversation. The key, of course, is preparation. Spending time taking positive action to prepare is more constructive than spending that time worrying about what could happen, how hard it is going to be and assuming the worst. These three questions introduce you to the areas you need to consider before any difficult conversations at work so you can perform at your best and get the optimum results every time. The amount of time you spend on each question will vary depending on the circumstances; it may a quick mental checklist, or something you need to sit and really work through. Question 1: What really is the situation? Getting to the bottom of what is really happening is going to give your difficult conversations at work a firm foundation. Gather your facts and separate them from your feelings. If possible, and if appropriate, talk to others whose input will be able to support your fact finding. Consider what impact the situation is having, both on your business and on you. Knowing the size and the scope of the consequences will allow you to ensure that the reaction and the outcome are appropriate. Having identified the facts and separated them from the feelings, it is also important to think about how you are reacting to the situation. What assumptions are you making? What personal hot buttons are being pressed? What concerns do you have about the conversation and are they really valid? Are you avoiding the conversation in the hope of a miraculous recovery? In truth we have all done this to avoid difficult conversations at work – but we have probably all found the longer we leave something like this, the harder it gets! Question 2: What do I want from the conversation? Take time to consider the purpose and objectives of the conversation. Think through the outcomes you are looking for and what options there are. What do you need to achieve? What would you like to be different as a result of the conversation? Thinking these things through ahead of any difficult conversations at work will allow you to really focus on what is being said and listen to understand the other person’s perspective, rather than to spend the conversation trying to work out your response. Question 3: What do I need to do to be ready for the conversation? Time to get planning! What are the practical things you need to consider ahead of the conversation? What is the best time of day? Where is the best place to have the conversation? Should anyone else be present? You’re probably not going to get the best results in an open plan office! You also need to prepare yourself. Take some time to think about how you need to be and what behaviours you want to exhibit in the meeting. My own management experience, and the same has been reported by my clients, has highlighted the importance of keeping an enquiring mind during the conversation, keeping calm and listening to the other person. Taking a few deep breaths not only calms you down but ensures your brain has the oxygen it needs to perform well. Being compassionate, considerate and listening actively demonstrates the respect you have for the other person. Being comfortable with silence allows you and the person you are talking to time to think and process the information that is being discussed and will help you get to a resolution that works for you both. What do you need to do to go into the conversation ready to be like that? Personally, and I suspect I am not alone here, I find the hardest part is getting started. What are you actually going to say? Your opening sets the tone; it can make the whole conversation easier, or it can make it really difficult. Have you ever been on the receiving end of bad news where you knew something unwelcome was coming and you just wanted the person telling you to spit it out rather than beat around the bush for what feels like a lifetime? It is horrid and we don’t have to subject people to that! While scripting the whole conversation isn’t going to work, planning how you’re going to open the discussion is a really good idea. Once you have answered these questions you should feel ready to take action and have those difficult conversations at work, without them feeling nearly as daunting as you thought they would be. Support can make all the difference when planning for difficult conversations at work so get in touch to book a consult call and let’s chat.